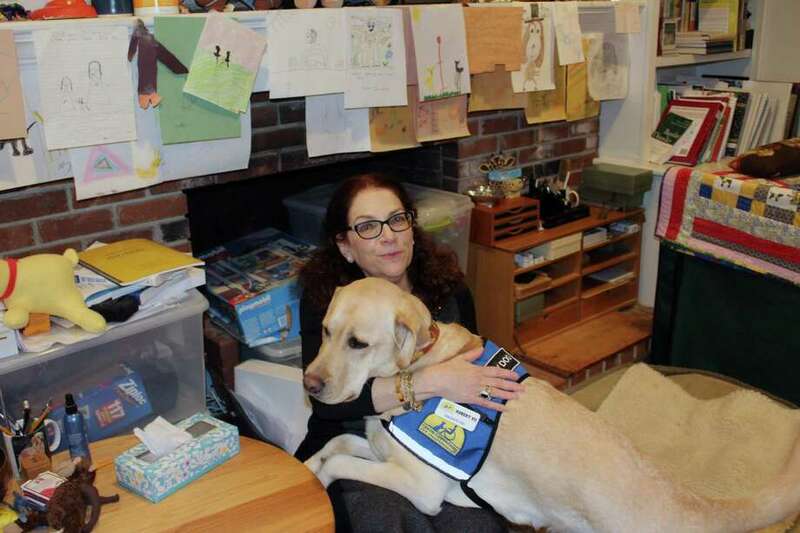 Dr. Nancie Spector with facility dog Robert in Spector's home office in New Canaan. NEW CANAAN — The lobby walls of Nancie Spector’s New Canaan office are lined with photos of her dogs, her many degrees, drawings from patients and, notably, photos of famed psychotherapist Sigmund Freud, one of which depicts the German analyst on his balcony beside two chow chows. According to Spector, late in Freud’s career he and one of the chows, named Jofi, became so entwined that, after 50 minutes of a session had elapsed, the dog would get up, stretch and head for the door, indicating to Freud that time was up. Spector, a psychologist herself, believes strongly in the palliative capabilities of dogs and, like Freud, has used canines in her work for nearly two decades. Most recently, she paired with Canine Companions for Independence (CCI), the largest nonprofit provider of assistance dogs in the world. After a long application process, Spector received Rand in 2008. After a good run, Spector retired the dog, keeping him on as a pet. She then started process all over again, eventually ending up with Robert, a four-year-old yellow Labrador-golden retriever mix, in 2015. In the two years since, Robert has remained at her side, a steadfast assistant in her work to address issues of mental health. CCI is the nation’s largest and oldest assistance dog organization, placing 366 dogs in 2016. But according to John Bentzinger, who does public relations for CCI, they’re in need of more puppy raisers. “The more puppies we raise, the more people we can serve. We’ve got a waiting list of about a year-and-a-half to two years,” Bentzinger said. CCI charges nothing for a dog awarded or any of its follow up services. He estimated a cost of $50,000 to raise and train each dog. Q: How long have you been involved with CCI? What was your reasoning? A: Robert is my second facility dog from CCI. Before that, in 1999, I had a golden retriever therapy dog, which is a very nice dog that usually passes the canine-good citizen test and that might have had some training. The therapy dog was incredibly sweet and fabulous with the kids actually, but it was a completely different thing than a facility dog. It was very clear to me once I started educating myself that a facility dog was a completely different thing — So I applied to CCI. I had to fill out a very extensive application. They interviewed me over the phone, then I had to go to Long Island and they watched me interact with dogs and had an on-site interview. I got Robert in February 2015. Q: In applying to CCI, what kind of dog were you looking for? A: I wanted a very calm, laid-back dog because some of the kids I see don’t like dogs. Some are afraid of dogs. I said I wanted a dog that liked to be petted and touched and was good with children. And I told them that there can be crying and loud noises in my office and the dog has to be comfortable with that. It took them about three years before they found Rand, Robert’s predecessor, in May 2008. When you get a dog from them, you have to go there and live on the campus for two weeks for a training program. Q: Where are CCI dogs bred? A: The dogs are all bred in California. They stay there for eight weeks, then they’re sent around the country to puppy raisers, who take care of them for a year-and-a-half. Then they return to the regional center, in my case Long Island, where they stay for six to nine months for additional professional training. Q: In what ways are facility dogs helpful in a session? A: It’s really been a huge asset to my work because the kinds of kids I see, babies on up, sometimes aren’t always happy about coming for treatment. I had a 12-year-old boy last year who was apprehensive about coming in here and wouldn’t get out of the car in my driveway. He was very polite and kept saying to me that he was very sorry but he couldn’t possibly come in and have his session and maybe some other time he would come back. I was out there for about 15 minutes and got nowhere. I came back in here, put Robert on a leash and walked him out to the car. I went with Robert into the minivan and handed the leash to the boy and said, ‘Robert needs to go back into the office, can you please bring him in?’ He got up and walked right into my office holding the dog. I never had another problem with that boy. I was able to help him and I don’t think I would have been able to do that had I not had such a great assistant in Robert. Q: Specifically, what commands can Robert perform to alleviate a patient’s anxiety? What is his function during a session? A: He will put his head on children’s feet. He also will do a lap command where he’ll climb his top half onto someone’s lap, which a lot of kids like from a pressure point of view. I don’t do what’s called animal-assisted therapy. That’s where somebody is specifically using the animal to get a person engaged in tasks. I use him as a reinforcement or to make people more comfortable. I had an adolescent girl who had seen something awful on the internet. She came in and said, ‘I’m going to tell Robert about this. You can listen.’ She sat down on the floor next to the dog bed and talked to him. So Robert enables me to do my job. It’s really an incredible asset and tool. Q: In what professions are facility dogs typically used? A: The facility dogs go to occupational therapists, physical therapists, nurses. Some are used in court when children have to testify in a very difficult situation. They all have to be really well trained and be able to do what’s needed on command. Q: Have you treated any kids who came in with a phobia of dogs who, in meeting Robert, were able to get over their fear? A: I actually have specifically been asked to treat dog phobia. If you talk to children who are afraid of dogs, they’re afraid of sudden movement, being jumped on, being knocked over and things being taken out of their hands. When they see that Robert isn’t going to do anything like that, it usually just takes a few sessions and then they’re very happy to interact with him. Q: How is Robert with your two other dogs? After work is he able to play with the others? A: They love each other. There’s a command release. So we go upstairs and I tell him the command and he runs around with the other dogs and plays with his toys. He’s got his off time and that’s very important in order to keep him healthy. He can’t be working all the time.